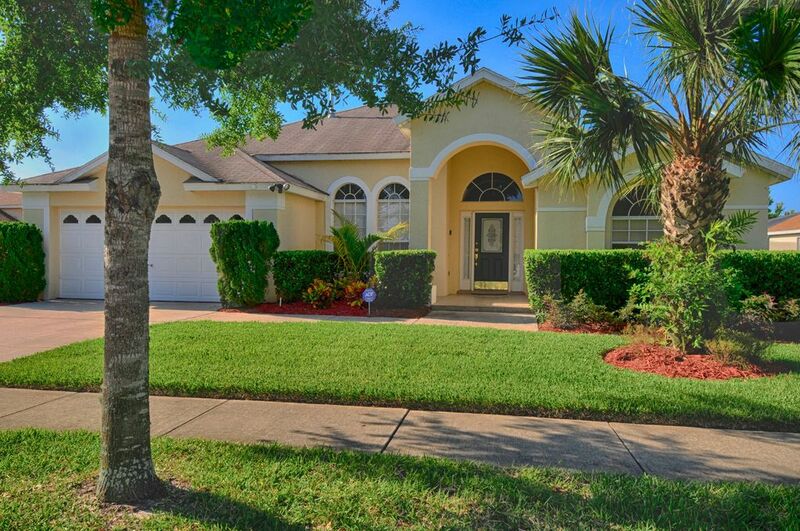 Signature Quality, Signature Style - Luxury Villa only 12 minutes to Disney. If you are looking for 'high end' accommodation, this is the vacation home for you! With 5 bedrooms and 4 bathrooms, we can sleep up to 12 people in comfort. We have one strong and abiding theme which runs through every aspect of renting our Orlando vacation home. It is one which stands for genuine high quality and great value for money. We appeal to clients who seek the type of ambiance found only in high end vacation rental accommodation and high class hotels. Our clients seek genuine luxury in a private but spacious environment, one where their family and friends can relax and unwind. Our Orlando vacation home rental service has satisfied the demands of many discerning clients, all of whom feel they have received excellent value for money from a high quality product and an exceptionally focused and responsive service. Enjoy the peace and tranquillity of our non-overlooked, South facing, extended, gas heated pool and spa, overlooking a stunning conservation views and watch the setting of the sun from the privacy and comfort of our warm and soothing Jacuzzi. However, don't just take our word for it! 82% of our clients return to stay with us again and their genuine comments can be found on the reviews that we have received, all these can be seen on the reviews tab. We can, therefore, with real confidence, invite you to book our home! Walk through the door and immediately experience the air of opulence derived from an Orlando vacation home where all the furniture has been separately sourced and hand picked from high quality suppliers! A spacious but inviting family room and a separate elegant lounge provide all the space you need to take time out and relax in this beautiful vacation rental home. To enjoy the al-fresco feel of Florida evenings, a high quality Weber gas BBQ, along with extra gas is provided for your convenience. Luxuriate in the elegant en-suite bathrooms, no waiting for your 'turn'; our Florida vacation rental home offers 4 bathrooms, 3 of which are en-suite to 3 of the 5 bedrooms. The master bathroom, which was re-modeled in 2016 features twin granite vanity units, granite surround deep plunge tub and a walk in rain shower. The same can be said for the second master bathroom that was re-modeled in 2017, also with granite vanities and a walk-in rain shower. There is a fully equipped air-conditioned games room with a full size slate pool table, air hockey and a 55-inch TV and a Wii console. In the family room, you will find a 65-inch widescreen, Ultra HD 4K TV now with premium sports channels, HBO, Showtime, Cinemax and Netflix, PS4, DVD and DVR. 36 or 22 inch HDTV's all with a full premium cabl;e package can be found in all five bedrooms. Ultra high speed wireless internet is available through out the house, and thanks to the additional Spectrum Echo hotspots, there is excellent reception out on the pool deck as well. * Samsung gas range and microwave. * Double door fridge freezer with ice maker, and filtered water. * Filter coffee machine, and just about every utensil a modern cook could ever wish for. Whilst being away on vacation, we have found that guests do not want to be bothered with the trivial matters that you take for granted back home. As a result of this, we make sure that the pantry is well stocked with some of the day to day necessities that you will be needing to make your stay that little more comfortable. In the pantry you will find paper plates, serviettes, plenty of rolls of kitchen paper, plastic wrap, aluminum foil and lots of food storage boxes. Under the sink (which has a child lock on it) you will find a wide selection of cleaning material, dish soap, hand soap, trash bags and a big box of dishwasher tablets. In the laundry room you will find a high end Samsung washer and dryer along with an ironing board, iron and drying rack for dedicates. For your convenience we also supply large quantities of laundry soap and conditioner. On arrival, you will find a well thought out welcome pack waiting for you, which includes a selection of beverages, filter coffee, hot chocolate, creamer and sugar as well as a selection of candy and snacks. In each bathroom there is a tastefully created selection of quality soap, shampoo, body lotion and makeup removal wipes. Under the bathroom sinks, there are plenty additional rolls of toilet paper. Snuggle down onto high quality pillow top mattresses, covered in cool, quality high thread count Egyptian cotton linens. All linens and towels, enough for all the family are supplied, and there is no need to bring your own. For your added comfort, all the bedrooms and living areas have ceiling fans. Why not spoil yourself a little more - take advantage of our optional Daily or weekly Maid Service or the wonderful Chef at Home service. If you must, keep your 'Finger on the Pulse' , then as well as the wireless broadband there are unlimited local, national and international phone call provided. If you can tear yourself away from the peace and tranquility of this wonderful vacation rental home, enjoy the on-site tennis and pickle ball and the full sized soccer pitch, all just a short walk away, great for working off those little moments of over indulgence! For the little ones - then two, close by and safely sited, 'tot-lots' are a really great facility. The extended size south facing pool and spa benefit from being gas heated, which means that you will not having to wait for hours and hours for the pool to heat up. We recommend pool and spa heating during the cooler months of October through April . On the extended pool deck and covered lanai there are plenty of comfortable chairs and sun loungers. There are plenty of pool towels for you, and please feel fee to take them to the water parks and beach. So why not experience all Orlando has to offer – great theme parks, great restaurants, golf, fantastic countryside and great shopping – all close enough for very easy access, but escape to the luxurious haven our home offers when the excitement of the day leaves you seeking the peace and tranquillity that Signature Villa can offer. PLEASE NOTE: OUR ORLANDO VACATION RENTAL HOME IS INSPECTED AND FULLY LICENSED BY THE STATE OF FLORIDA AUTHORITIES. We are Mark and Reut from the UK. We hope you will enjoy looking at the details about our home. We have both worked extremely hard to design and furnish our home to the highest possible standards. Along with our two children, we all love being at Signature Villa, and hope that you do too. We visit regularly and we are delighted to share our great facilities with discerning guests who really appreciate quality and high end accommodation. Location, location, location! With access to all Orlando's attractions only being minutes away from out doorstep, and couple this with the exceptional facilities that we can provide you. We feel that this is probably one of the best vacation homes that you can find. We love the fact the pool is not overlooked in any direction as well as being south facing, and has a superb view from the pool deck. Beautiful upgraded bathrooms, two of which have brand new rain showers. Each bathroom is supplied with a selection of high quality toiletries and plenty of bathroom tissue. High quality 400 count all cotton linens. Ultra high speed 200 Mbs wireless internet with whole house "Echo"
Plenty of fluffy towels provided. Super quiet Bosch dishwasher with an unlimited supply of dishwasher tablets. Regular filter coffee maker and a Keurig coffee maker. A welcome pack is supplied to every party arriving containing basic grocery and cleaning items to make your stay more pleasurable. Plus all the pots, pans and flatware, silverware and bakeware you need. A modern well equipped kitchen with granite worktops throughout. A selection of games provided. * A great peaceful cul-de-sac location. * South facing, larger than average, extended heated pool and spa. * Stunning natural conservation area views from the pool deck. * Fully equipped air conditioned games room with a Nintendo Wii games console and a 55' TV. * Two superb living rooms - ideal for large groups or two families needing space to do their own thing. * Dining room, kitchen, breakfast nook and full laundry room. * 5 luxurious bedrooms, 3 of which have en-suite facilities. * 4 luxury bathrooms. * Family room with 65' HDTV, HBO, Showtime, Cinemax, Netflix and premium sports channels and Sony PS4 games console. * Complimentary Gas BBQ with extra gas * Filter coffee maker and Keurig coffee maker * Re-modeled bathrooms with granite vanities and walk in rain showers * Re-modeled kitchen with superb granite work surfaces throughout * Unlimited supply of toilet tissue, kitchen paper, dishwasher tablets, dish soap, laundry detergent and conditioner, garbage sacks, aluminum foil. * 25 minutes drive (on average) from Universal Parks and Sea World. * 45 minutes drive from Orlando International Airport. * 65 minutes from both coasts. * 60 minutes from Kennedy Space Centre. * 5 minutes from Lake Louisa State Park. * 5 minutes from several championship golf courses (discounts).